Yes, the rumors are true – here in food blog-land it’s time once again for the annual Menu For Hope! For those of you who have recently joined us, the Menu for Hope is an annual event founded by Pim and collectively run by food bloggers around the globe in order to raise money for those desperately in need. Last year was an incredible success, with over $60,000 raised for the UN’s World Food Program, an organization dedicated to providing emergency food aid and carrying out rehabilitation and development programs for populations around the world. This year we are funding the WFP again, but they have allowed us to earmark our funds for a specific program, a school-lunch program in the kingdom of Lesotho, South Africa. The food situation in Lesotho is dire. After five years of drought, it is estimated that disease and malnutrition claim the lives of one in 12 children before they reach the age of five. The kingdom is also confronting the triple threat of increasing chronic poverty, rising HIV/AIDS rates and weakened government capacity. This threat takes a heavy toll on the households of the rural poor in Lesotho; 56% of the population live on less then $2 per day, and for children born today, life expectancy is only 36 years. Currently, the WFP’s school feeding programme provides a daily nutritious meal to nearly 150,000 children. Even more importantly, they have been pushing for local procurement for much of this food: instead of buying surplus food in the US and shipping it to Africa to feed the kids, they are now buying maize and other produce from the local farmers, thereby putting funds back into the local economy. If you’re interested, here are the full details of the program, which stands as a model for sustainable development assistance in Africa. And you can help support it! All it takes is a small donation, even $10, and not only will you be helping to fund the WFP’s activities, you’ll also be entering yourself in a raffle to win one of dozens and dozens (hundreds? thousands?) of absolutely incredible prizes from food bloggers around the world. Sounds pretty much like a win-win situation for everyone, doesn’t it? I will be happy to ship these books anywhere in the world, provided amazon.co.uk normally ships there. Please note, however, that these are the UK versions of these cookbooks, with British terminology and metric measurements. I really don’t think this should be a problem for anyone (and by this I mean you, Americans! ), but nevertheless, if the winner happens to live in a metrically-challenged area, I’ll be happy to offer my recipe-consulting services to help you interpret and adapt the Moro recipes to your own kitchen. 1. Choose a prize or prizes of your choice from the prize list at http://www.chezpim.com/blogs/2007/12/menu-for-hope-4.html. You must make sure to check the terms and conditions for the individual prizes BEFORE you bid, as some will come with restrictions regarding where they ship to or how long the prize is valid for. 2. Go to the donation site at http://www.firstgiving.com/menuforhope4 and make a donation. 3. Please specify which prize you’d like in the ‘Personal Message’ section in the donation form when confirming your donation. You must write in how many tickets per prize, and please use the prize code. The code for my prize is UK20. 5. Please check the box to allow us to see your email address so that we could contact you in case you win. Your email address will not be shared with anyone. Check back on Chez Pim on Wednesday, January 9 for the results of the raffle. I will also post an announcement here with the the winner of my prize. Thank you so much for your support and for helping to make this event even more successful than last year!! A great prize for a great cause. Those are some of my favourite cookbooks ever, especially the second one! I haven’t actually seen Moro East yet…maybe it’s time to change that. these books look absolutely amazing, and I’ll definitely look them up. Anyone to win them will be lucky! I borrowed this cookbook from a friend and it’s been 2 months. 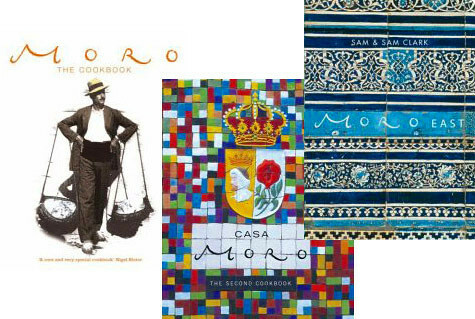 I haven’t given it back yet – I just love the Casa Moro cookbook!